China Eastern Airlines sent the flight attendant a dismissal letter. Love is in the air? We thought so, too, but this is the real world, and apparently, that doesn't matter as much as rules. 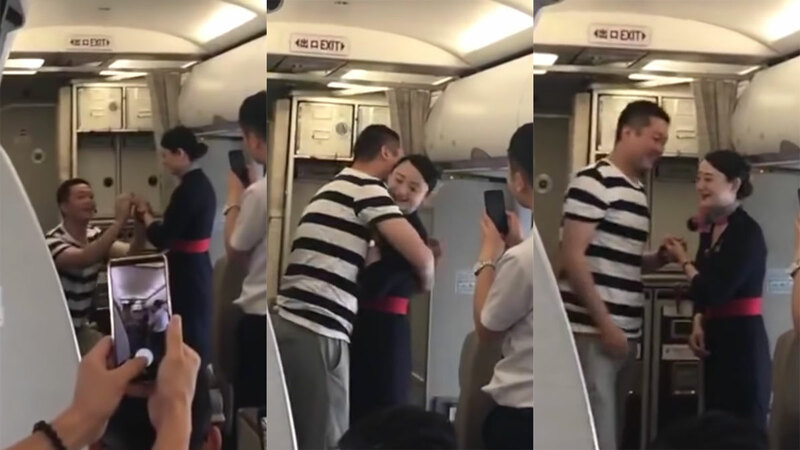 This video of a China Eastern Airlines flight attendant getting engaged to her boyfriend mid-flight went viral on Weibo in China last May 2018. ICYDK, Weibo is a popular Chinese social media platform. The flight was from Xi An to Yinchuan. Afterward, the flight attendant thanked all the passengers onboard via the announcement system, and everyone erupted in applause. Unfortunately, China Eastern Airlines didn't quite share the same sentiments. According to Liaoning STV via Singapore's Channel 8, the airlines sent the flight attendant a letter of dismissal, citing the engagement as a "disturbance," which put all the passengers at risk. There has been no official statement from China Eastern Airlines.